The National Dog Walk charity helps some of the hardest-working people in Ireland: voluntary family carers looking after loved-ones who are elderly & frail, seriously ill, people with disabilities and children with special needs. The National Dog Walk is a vital fundraiser. The second National Dog Walk is on Easter Monday April 25th – sign up your four-legged friend for this 5K walk and do something wonderful for The Carers Association supporting voluntary family carers in the home. 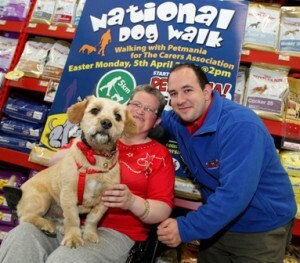 The National Dog Walk is held at 13 Petmania locations around Ireland, including Tullamore and Portlaoise, each with the prize of a year’s supply of Royal Canin food awarded to the dog raising the most sponsorship. If yours is Ireland’s Top Dog – raising the most money nationwide – your family of up to 2 adults and 3 children will accompany him/her on holiday to the 4-star Harvey’s Point Hotel in Donegal for 5 nights B&B + 2 evening meals!